The city of Glasgow is recognised as one of the most dynamic and vibrant locations in Europe and can not only boast being the largest in Scotland but it has also recently been ranked the best retail centre in the UK outside of London. St. Enoch occupies a pivotal position in the heart of Glasgow city centre giving it a prime retail pitch and currently comprises 824,000 square feet of retail and leisure space across 116 separate units, attracting with it over £1.89 billion of comparison goods spend per annum. The centre itself was originally developed in 1989 and following a substantial £150m refurbishment and extension, which was completed in 2010, now provides a modern shopping environment to some of the UK’s largest retail chains. 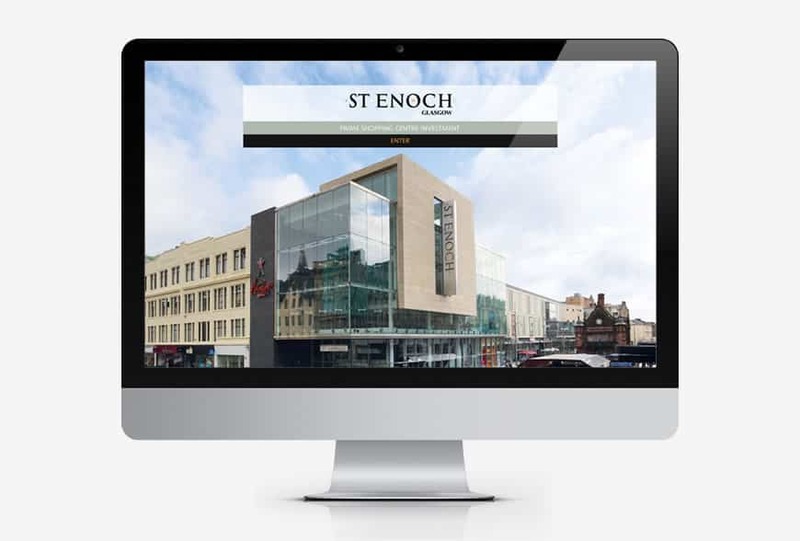 Our team was exclusively instructed by the Cushman & Wakefield investment team to develop a strategic marketing campaign for the newly available St. Enoch scheme ready to put to the market. The brief was to create a bespoke marketing package that showcased the scheme’s potential, personality and its financial standing. In order to best showcase what the centre had to offer in its entirety our design team firstly produced a bespoke 32 page, case bound brochure, showcasing both aerial and location photography, custom drawn sit maps and charts where designed and included detailed in-depth analysis of the site’s financial standings, including tenancy schedules. The portfolio was also built into an interactive brochure format allowing the Cushman & Wakefield agents to easily send information through to interested parties. As part of the marketing package a custom built interactive website was designed and developed. The site included fully downloadable documentation, which could be accessed through a secure login data room. Downloads could also be monitored through a statistics segment.